The 737/737R have a footprint of 33"W x 24"D. This space is not lost as the sturdy, flat top can serve as a benchtop. Or, you can stack two of the 737s or a 737 and a 737R on top of each other to save space. With a height of 34", the 737 can fit under many benchtops, while the taller refrigerated 737R (at 41") cannot. The 20.5"W x 18.0"D platform is large enough to accommodate nine 1-liter, six 2-liter, twenty-five 250-mL, or two 6-liter flasks. The 737 and 737R use the same shelf system as the 727. The 737R is equipped with a frost-free refrigeration system for working at, or below, ambient temperature. 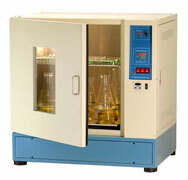 Two thermostats protect valuable samples from over-heating and over-cooling/freezing. The chamber has a built-in outlet used for powering small equipment such as a cell bottle roller or a rocker. The 747/747R design is similar to that of the corresponding 737/737R, but offers more capacity. They can accommodate just as many or more flasks of a given size than the chest type 767/767R. Moreover, they also offer advantages over chest type shakers such as a shelf, a smaller footprint, and the ability to stack two units. The 787/787R are affordably priced models with similar performance as the 737/737R and 747/747R. They are excellent alternatives when there is a budget contraint.